When is a phone not a phone? When it’s a camera, of course. That’s where we’re at with most new-fangled smartphones — the phone functionality itself is a secondary consideration, while its various internet-connected apps and features are pretty much a given. In 2018, the quality of the camera is nearly always positioned as the main selling point and differentiator. When Samsung launched the Galaxy A9 last week, it touted the phone’s four-lens rear-facing camera, which includes telephoto, zoom, and depth features. A few months back, Light raised $121 million to bring DSLR-quality photos to mobile cameras through algorithmic imaging. Reviews these days also tend to focus on the quality of the camera, as with the recent iPhone launch and Huawei’s P20 Pro, which we called mind-blowingly awesome. With that in mind, Chinese smartphone giant Huawei today unveiled the Mate P20 and Mate P20 Pro and, again, the camera (both hardware and software) was a major focal point. The company showcased a new ultra wide-angle camera lens, for starters, but a couple of particularly interesting video camera effects stood out. You will have noticed that “bokeh” has become a buzzword in smartphone photography — due to improved depth-sensing capabilities that blur the background while keeping the subject firmly in focus. 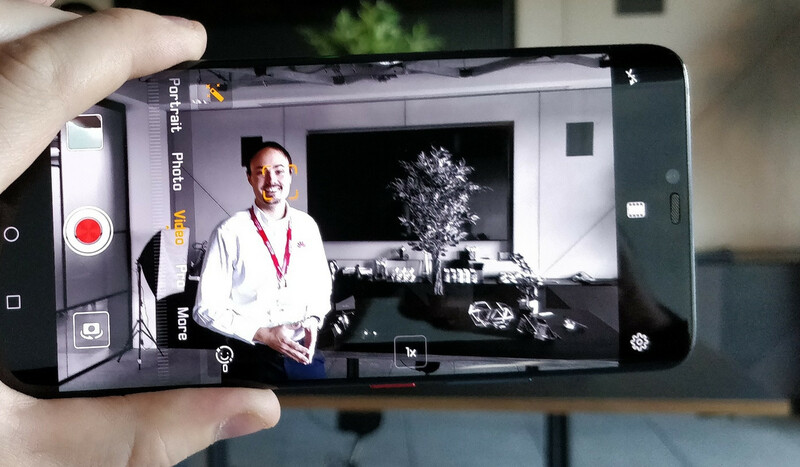 Well, the Huawei Mate P20 range can now do that with video so that when you follow a person around a room, the background is blurry while the subject remains crystal clear. But arguably the more interesting effect is what Huawei is marketing as “AI Cinema” mode, which is capable of rendering both color and black-and-white images in a single shot, similar to the color pop feature recently announced for Google Photos. In the device itself, Huawei actually calls the effect “AI Color,” and it sits just to the left of “background blur” — the bokeh video effect. When you activate the AI Color feature, the subject you are following remains in color while everything else is in black and white. This presumably works for pets too (we didn’t have any hamsters on hand), and we are told it can also work for inanimate subjects. Here’s a quick GIF we made of the effect in action. It is possible to recreate similar effects in professional video-editing software, but having something like this baked into a smartphone — and able to work in real time — is a notable advance not only for smartphone camera technology, but for the underlying AI-powered computer vision smarts that enable it. If you’ve seen the award-winning 2005 flick Sin City, you’ll know what Huawei is playing at. Sin City garnered critical acclaim for the way it mixed splashes of color into what was largely a black-and-white movie, allowing one character in a scene to be represented in color while everyone else remained monochrome or to appear in color against a black-and-white background. Some scenes were rendered with just a smidgen of color sprayed across an otherwise black-and-white screen. Huawei’s effort isn’t quite up to the standards of Sin City‘s color-processing prowess, but it shows how technologists are pushing the boundaries of what is possible with a tiny AI-infused pocket rocket. It also serves as yet another reminder of how big a marketing role the smartphone camera now plays. The fact that the Huawei Mate P20 / P20 Pro has ditched the 3.5mm headphone jack wasn’t mentioned throughout the announcement, and nobody really even asked the question. I briefly considered asking about its omission, but what’s the point — it’s pretty much assumed now that most flagship phones won’t come with a headphone jack. It’s a minor inconvenience, designers think, when all people really care about is the camera.